Hey guys I’d be making an affnaija review today.� A legitimate online business in Nigeria where you can make atleast N700 daily doing just few task such as posting a status on Facebook. ALERT: Affnaija is no Longer Paying as they run out of budget earlier January 2018. The latest 100% paying is nnu income program, click here to register. UPDATE: Payment Received [Affnaija Payment Proof] Keep Reading Below. The Procedure is very simple, Create an Account with Affnaija, Subscribe to a Plan, Share Products from your dashboard and get paid straight into your Bteeank Account. If you are the type that don’t like much investment you can checkout the post on how to make money online in Nigeria without spending a dime and without scamming. you can make money online doing nothing. Whoever tells you that only wants your money and nothing else. DISCLAIMER: I have tested the program and is working; however you should know everything about making money online is Risk, If you can’t take risk then don’t read further. Now on this post I want to show you a new investment opportunity you can use to make money online in Nigeria. You can�earn up to ?10,000 monthly just by promoting products on facebook. Introducing to you Affnaija Program, below you will see the review of this legitimate business and how you can make money with it. So whats up with the Affnaija Program? Affnaija is affiliated with Jumia the large marketplace in Nigeria where you buy things and get delivered to your doorstep upon payment. Jumia needs more people and websites to promote their products and so affnaija is in a good position to help jumia promote these products to get them some sales. So they pay Affnaija some amount of money to get this Done. Affnaija are not able to do this all by themselves, they need people like you and I, to help promote the products further. As a result, they are looking for you to help them promote this products. If you join the program right now, you will earn from as high as N700 – N4,200 every day just by sharing those products with your friends on Facebook. If you have up to 300 Friends on facebook and you share the link, your friends if not all but atleast 50-1oo of them will see these products and may end up buying it. That’s how Jumia make their money too. Your own is just to share the products on facebook and you get paid up to N700-N4200. 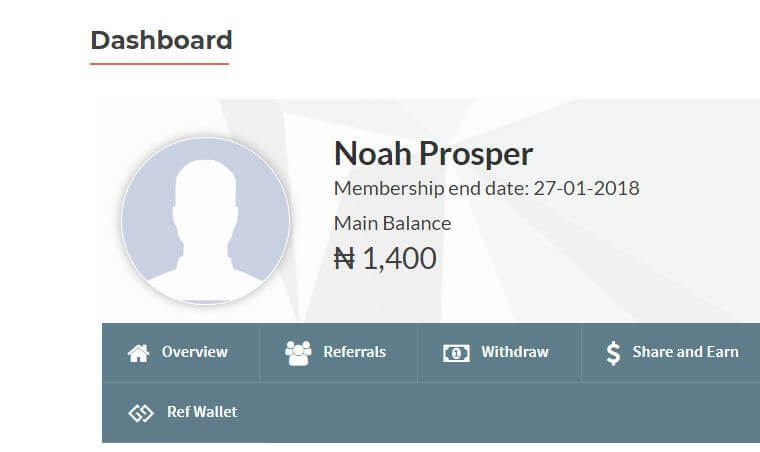 Note: I just opted in for this Program and earned N1,400 already as at the time of writing this post and when I cashout I will surely drop a second review for you to see. So you either decide to Join now with me or Later. Below is my first payment received from Affnaija just incase you want to still know how legit this is, as at the time of writing this Post. As seen above, I just withdrew N12,500 from Affnaija and the Top N700 is a payment for another sharing on Facebook. The steps are very simple here. Click on Register�or Learn More to register and fill in the correct details where you see “website url” just put your facebook profile url there. Select any of the available Plan as seen below and click Subscribe to fund your account. You can either pay with your bank debit card e.g. Mastercard, Verve, Visa Card etc..
You can as well make payments to their bank account without debit cards. All instructions of how to pay will be in the dashboard right away. You can Contact and pay to their agent below and they will fund your Wallet Immediately; so you can use it to purchase a Plan. You should Whatsapp or Call them. Note: Wherever it requests for sponsor’s username am your sponsor, just put in�workwithnoah�in the box. That’s how you will help me for sharing this wonderful business opportunity in Nigeria with you. When you’ve made your payment, follow the below to start making money. This is the money making part, Share an Earn. Now that you have paid, you will be taken straight to your dashboard where you can start sharing links on Facebook and Earn on Autopilot. Everything is simple from the dashboard. This is where your entire earnings easily showing both paid and unpaid earnings. This is where you click whenever you want to share a product on facebook to earn. Just click on it and you’d be redirected to the product, just click on the share to facebook button when done your account will be credited immediately. You should know what this is already about. This is where you withdraw your earnings whenever it reaches threshold. On this tab you can earn even more when you refer people to Affnaija. Just grab your link and share with them whenever they signup you as well earn more. It�s time to get started! You can request for Withdrawal any day of the week. Wait till you get alert before requesting for another withdrawal. They shall be verifying your referrals (if applicable) and the merchant products on your Facebook wall, so, processing of withdrawals can take up to 24hrs but not more than 72hrs. Make sure the form finished submitting and you get a successful response before leaving the page. Declaration of false amount in withdrawal and submission of withdrawal request multiple times is a serious offence, they take it that you�re trying to cheat. It can lead to ban for some days or for lifetime. Now that you know what this wonderful program is all about, I don’t want you to miss the opportunity. I hope this detailed affnaija review and payment proof will get you going, making money online in Nigeria easily. Sorry that was a mistake its N1000 per referral for Premium. I will update it now. if I’m in basic and I refer someone which register ultimate plan… what will be my referral bonus. No I made use of my verve card to pay online. But yes, you can as well pay to an agent [someone’s account] to subscribe you. whats the latest on affnaija now, are they still paying??? Of course they are ? You get credited automatically whether people buy or not. Your own work is just to share it to your Facebook account ? Make sure you use the affnaija link in this article, that way you appreciate me for recommending this great money making opportunity. Also share the post with your friends ? But why do we have to pay to advertise their service? So People can be serious in promotion! Do people need to buy b4 am paid for sharing?? This is really interesting. Thank you for this information. What is happening to the affnaija website? An upgrade of their server! There are definitely lots of visitors to the site, they need to upgrade their server so it can be able to contain more people ? You can also check out this Glo affiliate program. It is full of great discounts. I need my money as you said people who haven’t made withdrawal get 30%. I’ve requested for refund since but to no avail. What’s happening? I guess you need to contact their support. Am not an agent, i only review the site but for now, they have closed and i recommend nnu.ng as said in the post. Can I upgrad to higher level if I start to earn? How much will I pay then? Affnaija is closed to the best of my understanding. YOu can try nnu, check the beginning of this post.